Felix Baumgartner has been frustrated in his attempt to make the highest ever skydive. Unfavorable winds at Roswell, New Mexico, have prevented the launch of the helium balloon that was to take him to more than 120,000 ft (36.5 km). Meteorologists say Thursday now looks to be next best day for a record bid. Felix Baumgartner – famous for jumping off skyscrapers – is hoping to become the first human to break the sound barrier unaided by a vehicle. Because of the rarity of the atmosphere at 120,000 ft, he would accelerate rapidly once he stepped out of his balloon’s capsule. Calculations suggest he could achieve Mach 1 – thought to be around 690mph (1,110 km/h) at the target altitude – within 40 seconds. But this will all have to wait for another day. 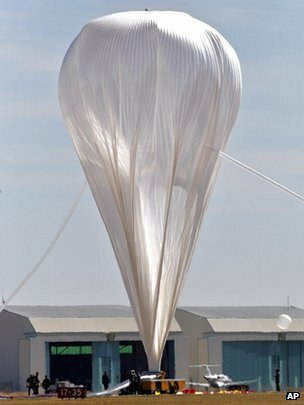 Felix Baumgartner’s 30 million cu ft (850,000 cu m) polyethylene balloon has very strict launch requirements. Wind speeds from the ground up to about 800 ft (250 m) must not exceed 3 mph (5k m/h), or there is a chance the envelope could shred as the support team try to release it and the capsule. And although Tuesday morning’s conditions at the surface were dead calm, the winds at times were just too gusty. Felix Baumgartner got as far as climbing into his capsule before the mission was postponed. The latest weather intelligence had suggested there would be a good window to get airborne, but as the balloon filled, a sudden 25-mph (40 km/h) gust twisted the envelope and knocked it flat against the ground. That could have damaged the thin skin of the balloon and so flight controllers felt they had no option but to abort. The current weather window for this year probably extends for another month. Beyond that and the team will likely have to return next year. Felix Baumgartner is trying to topple records that have stood for more than 50 years. The previous highest skydive was made by retired US Air Force Col. Joe Kittinger, who leapt from a helium envelope in 1960. His altitude was 102,800 ft (31.3 km). The adventurer first discussed seriously the idea of taking on the challenge in 2005. Since then, he has had to battle technical and budgetary setbacks to make it happen. What he is trying to do is extremely dangerous. At an altitude of 120,000 ft (36.5 km), the air pressure is less than 2% of what it is at sea level, and it is impossible to breathe without an oxygen supply. Others who have tried to break the records for the highest, fastest and longest freefalls have lost their lives in the process. Felix Baumgartner’s team has built him a special pressurized capsule to protect him on the way up, and for his descent he will wear a next generation, full pressure suit made by the same company that prepares the flight suits of astronauts. Although the jump has the appearance of another Felix Baumgartner stunt, his team has stressed its high scientific relevance. The researchers on the Red Bull Stratos project say it has already provided invaluable data for the development of high-performance, high-altitude parachute systems, and that the lessons learned will inform the development of new ideas for emergency evacuation from vehicles, such as spacecraft, passing through the stratosphere. NASA and its spacecraft manufacturers have asked to be kept informed.